There are three basic approaches to treatment: medicine, surgery, and radioactive iodine therapy. You only manage the disease, not cure it. There can be serious and fatal side effects. Kidneys and liver can be damaged when used long term. You need to medicate your cat once to three times daily. 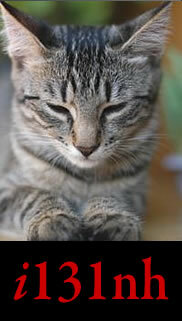 The costs of rechecks and medication can cost $500-700 per year for the rest of your cat’s life. You can anticipate that the TOTAL cost of this treatment to exceed the cost of the radioactive iodine. The surgery can be difficult to perform due to location of the thyroid tumor and the fact that the vital parathyroid glands are within the thyroid tissue (for this reason, the preferred option is to remove only one gland at a time). When only one thyroid gland is removed, 80% will develop a tumor in the other thyroid gland within 1 ½ years. Cost of one surgery is $800-$1500. In 80% of cases, two surgeries will be required. When surgery fails, radioactive iodine is the preferred next step. Hills Prescription Diets make an ultra-low iodine diet that can lower the thyroid level to the normal range. The cat needs to eat 100% only the y/d diet. The thyroid tumor continues to grow though. Some cats will not eat the y/d diet. If you have multiple cats in the house, you are probably going to have to feed all the cats the y/d exclusively to prevent any iodine being introduced to the affected cat. We don’t know the long term effects of y/d on normal cats. y/d has not been tested long term (>5 years) on affected cats. y/d is an expensive food. i-131 is the gold standard in treating feline hyperthyroidism. Consultation with your primary care veterinarian. Pre-therapy review of records, blood work and x-rays. i-131 dose specifically tailored to your pet. Hospitalization in a 24/7 facility continuously monitored by trained technicians and doctors. Any complications can be identified and dealt with immediately. Internet video access to your pet. Individual care of your cat including daily changing of bedding (more frequent if needed), monitoring of drinking and eating, monitoring of attitude and as much TLC as we can give given the State and Federal rules. Prompt referral notes to your primary care veterinarian. If requested or needed, consultations with you and your primary care veterinarian.